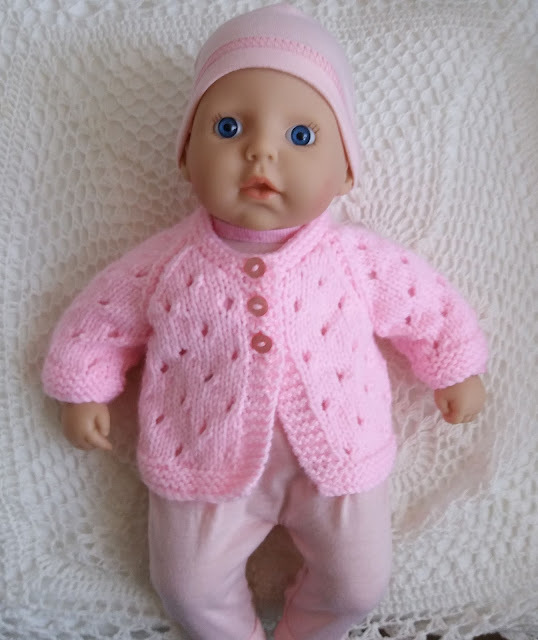 This is my first attempt at a jacket for a 14" Baby Annabell Doll. Its made in one piece to the armhole and has raglan shaping. I picked a simple eyelet pattern because I didn't want anything too fussy while I was working out the sizing and stitches. I used a budget yarn which knits up a bit bigger than the more expensive yarns so check your tension and add a few more stitches and rows if necessary. If you make this jacket and find any typos or errors, please let me know. Sew up raglan seams and sleeve seams. Sew on 3 buttons to match buttonholes. love the pattern only mistake is at right side front first roe. need to knit the last 4 stitches, not purl to end.